I’m Black, he’s Stout. Simple names for simple lives. We work together, best we can. Two sets of eyes can see opportunities in double quick time, take advantage before some other thief can step in and steal your pitch. If he goes hungry then so do I. We’re a team, Stout and me. A team. ‘Where are we going to eat today, Mr Black?’ he asks me. Stout knew I was joking. The best tables weren’t for the likes of us. Old Stouty and I aren’t welcome, you see. Our faces don’t fit. Not even close. It’s not just that the people don’t want us. It’s that they barely notice we exist. They don’t see us as we fade into the grey of the sky and the thick of the clouds. We fly in the shadows and pick at their pockets, trip at their feet. We were here before them and will still be here when they are long gone. We see everything and are seen only by the few. We’re in the woods and the concrete, we’re in the rafters and the gloom, we’re deep in the blood of the place. The truth is we eat anything, Mr Stout and me. That’s how desperately we live our lives. It might be the spoils of the fields or whatever we can salvage from the leftovers of those better provided for. We’d eat each other if we had to. It’s all fair game when you’re hungry. You’ve never known real hunger unless your belly has been properly empty. Empty like the wind or a broken promise, empty like a past forgotten or a future that will never be. Proper hunger drives you like the devil. What was fresh on the wind? Well now, there was a question indeed. But his hawk, his hound an his lady fair. So we may mak oor dinner swate. The place in the woods near Cardross is riddled with corridors and cells, chapels and concrete arches. It’s a derelict house open to all, weather and visitors alike, a dark maze of ruin and stagnant pools, of secluded and secondary thoughts. The tourists might venture there for a thrill or a dare but rarely after lights out, not after the safe company of others has gone home for the night. Then it becomes home to the likes of us and those who would do us harm. In the deep dark, the place in the woods is for dangerous travellers. They used to call it St Peter’s. They came here, young men all bright and shiny, seeking to learn how best to serve their shepherd. Priests of the citadel, children of the altar, dressed in black smocks from to neck to toe. One day, the button bright boys left forever and others arrived. Bags of bones with cheeks of flint, eyes dulled and skin grey, these new recruits were not like those who went before. This army served other gods who treated them badly. Stout and me, we watched them build it, this concrete palace, and we watched it crumble. Years it took as the wind and the rain ate it, chunk by chunk till the woods and the rhododendron swallowed it up, claiming it for their own. No matter how hard you looked, you couldn’t tell where nature stopped and the building started. It’s like that now, at one with the Kilmahew woods and those of us who live in them. At the edges, its ownership is blurred but at its centre it remains the sanctuary of the boy priests. This was where they came to pray to their god and, of a night or a winter’s morning, you can hear them still, young voices carrying on the wind. It’s dark and wet down there, guarded by a smashed granite altar, as blind as those who will not see. The sanctuary is a cold bed on a November morning, bitter in the shadows where the sun can’t touch. No place for a soldier boy far from home. No place for the dead to lie out of sight and mind. 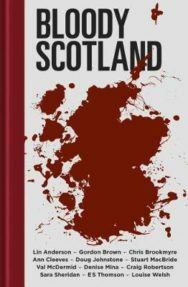 Bloody Scotland by Lin Anderson, Chris Brookmyre, Gordon Brown, Ann Cleeves, Doug Johnstone, Stuart MacBride, Val McDermid, Denise Mina, Craig Robertson, Sara Sheridan, E S ­Thomson, and Louise Welsh is available now priced £12.99. 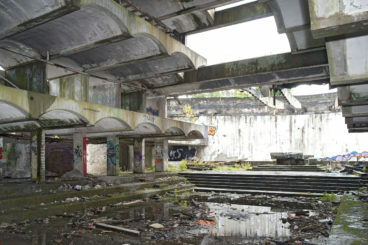 You can find out more about the birth, death and renewal of St Peter’s Seminary in this article on Books from Scotland.